Chrysler released the Valiant Charger in August 1971 and it immediately made a positive impression on the Australian motoring public. Who can forget those “Hey Charger” TV commercials with the victory “V” sign? The Charger was a purpose built two-door coupe that was 13.2 inches shorter than the sedan and 6 inches shorter in the wheelbase. In the process, the Charger lost 300 lb in weight. The Charger was the first Australian car with an integrated rear spoiler, and the roofline ribs running down past the rear window accentuated the sporting design of the car. The Valiant Charger was the Wheels magazine Car of the Year in 1971 with the acclamation, “Charger proved that it is possible to have an excitingly designed body and yet still have a practical car to carry five people”. The Charger’s main competitor that year was the ever popular HQ Holden. The R/T Chargers featured the E38 racing Hemi engines, which had shotpeened conrods and valve springs as well as upgraded big ends and main bearings. Extractors, finned alloy valve cover, high performance camshaft, heavy duty air cleaners, special inlet manifold and a range of other high performance modifications also featured in the E38 engines. The “6 pack” tag came from the three double-throated Weber carburettors. The surprise was that Chrysler only provided a three-speed gearbox and not the expected four-speed. In 1971, the E38 Charger was Australia’s fastest accelerating 6 cylinder car, significantly faster than the XU1 Torana, and only marginally slower that the V8 GTHO Phase III Falcon. Ten Chargers entered the 1971 Bathurst 500 enduro race, driven by a range of privateers plus the big name teams consisting of Norm Beechey/Jim McKeown, Doug Chivas/Graham Moore and Leo Geoghegan/Peter Brown. Allan Moffat started in pole position in a Phase III GTHO Falcon and was the eventual winner, followed in second and third places by GTHOs. Colin Bond in a Torana XU1 won Class D honours, followed by Leo Geoghegan in a Charger (and seventh position outright). Peter Brock in another XU1 was third in class. Of the ten Chargers that started, eight finished the race. 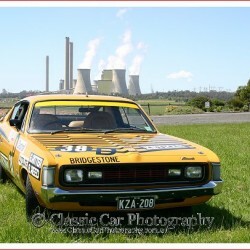 Brian “Brique” Reed and Graham “Tubby” Ritter raced Charger KZA-208 at Bathurst in the 1971 race, as car number 38D (ie in D Class) for owner Lee Seaton and West Heidelberg Motors. After practice on the Saturday, the mechanics had to carry out some significant repairs due to overheating caused by head gasket problems. During the race, the biggest problems were associated with the brakes. Brian recalled that at one stage there was so much vibration from the brakes that it set off the fire extinguisher during Tubby Ritter’s stint behind the wheel. Later in the race, the bolts holding the steering column came adrift. The Reed/Ritter Charger finished 118 laps in Bathurst 1971 to come in 16th in class and 23rd outright. KZA-208 retired from Series Production racing in December 1971 when Brian was involved in a dice with Norm Beechey’s Charger and then a head-on crash with an XU1 Torana down the back straight at Calder. The race was red flagged and abandoned. The Charger has been restored to close to original racing trim and is believed to now be the only “Bathurst” Charger to still be road registered. Classic Car Photography wrote a story on the Valiant Charger for Australian Classic Car magazine a few years ago and was delighted to catch up with Ray Iken, the Charger’s current owner, and driver Brian Reed at the recent Charger Club event at Caribbean Gardens. Click Here to visit our redbubble Shop for cards, prints and more featuring this remarkable E38 Valiant Charger.